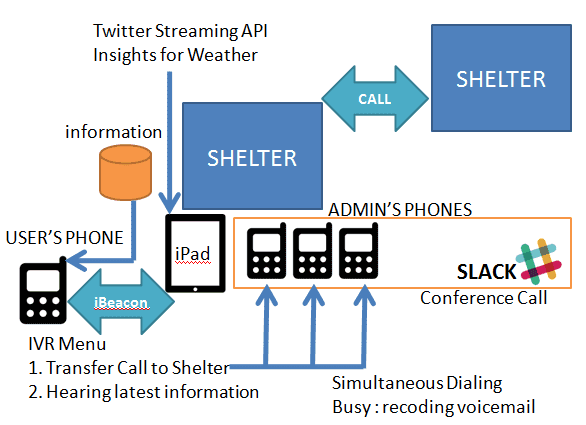 InstantCall is Call System for shelters. There is high possibility that shelter managers are also impacted by the disaster and the turnover at the position could be really speedy. In order to manage the shelter smoothly, this system aims to be a communication system which everyone can use easily. This system aims to be a system that everyone impacted by the disaster can communicate via various ways and get rescue and information without difference between people who has IT literacy and people who don't have. Instant call system for the people who manage shelters. Open your phone system by using iPad without phone numbers! Working connected with Street View by Google Map. Can confirm the shelters registered. Call : Can call by the iOS application without phone numbers. 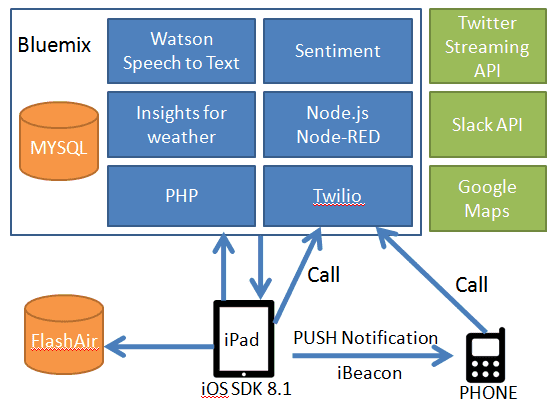 Answer list: Voicemail messages are changed to texts by Watson Speech to Text service, then Sentiment analysis results by the Sentiment API are shown. Telephone conference can be held between shelter management members. 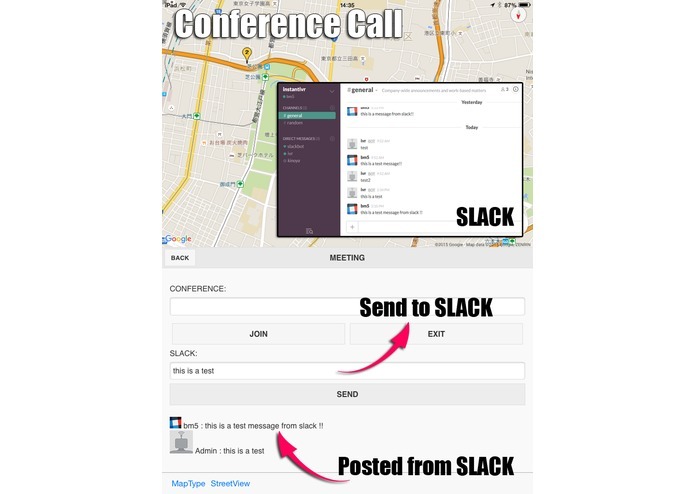 In addition, text chat function is available and connected with SLACK. Can find shelters closet to the center position on the map currently appears. 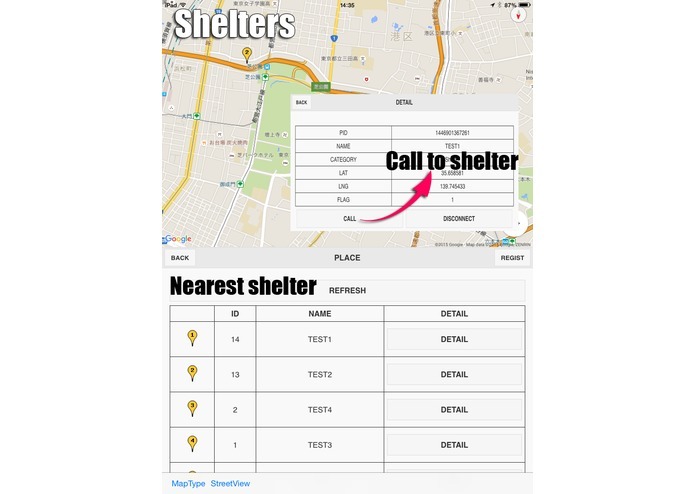 Can call to the shelters by the iOS application. In case multiple phone numbers are registered, can call all of them in one time and can talk to the person who take the call firstly. In case FlashAir is connected, the latest information saved in the SD card is also listed. In case FlashAir is connected when the registration is done, the information is saved both on Bluemix and FlashAir at the same time. Also, iBeacon server starts when the registration is done, iOS application users who are close place to the server will be noticed. The notice can be sent without starting the application. 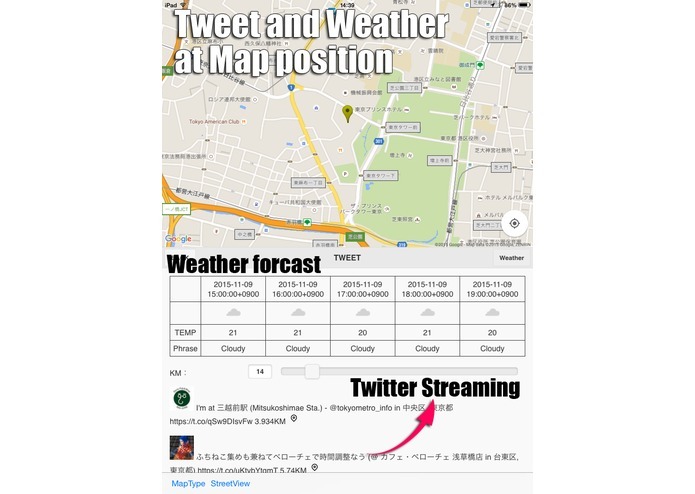 Listed real time tweets tweeted specified range from the center of the map. Weather forecast until 5 hours later at the center of the map. 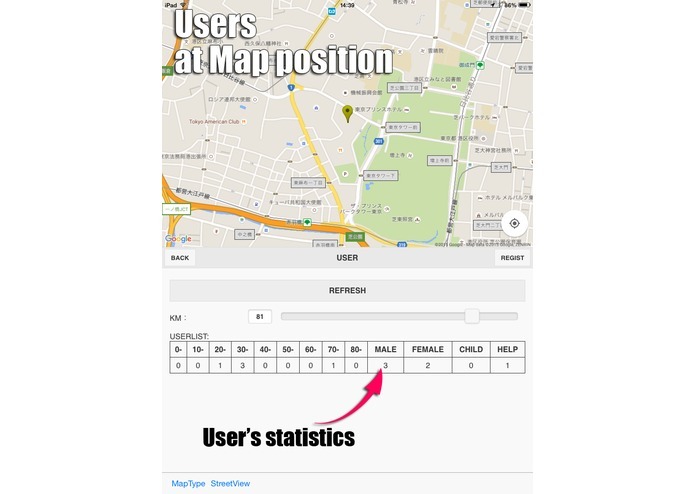 Users' statistical information in the specified range from the center of the map. Guiding message can be heard from the specified phone number. ・Listening to the latest information about the shelter. 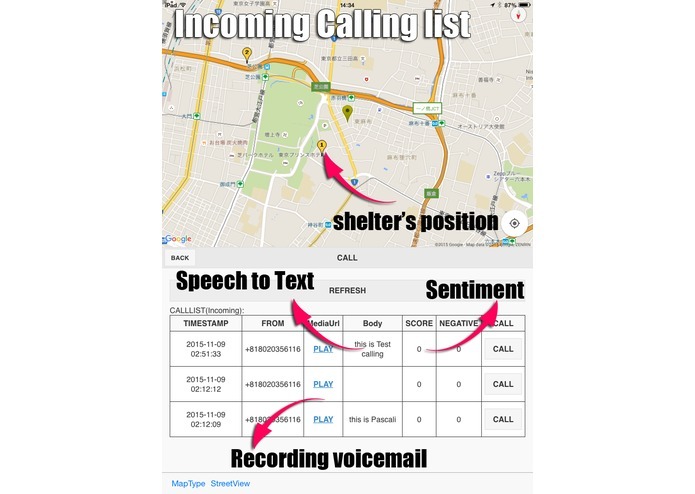 ・In order to get ready for the situation of hard phone connection, added voice mail function and then recorded voice mails are changed into texts to analyze their sentiment to help receipts judgement. ・In order to get ready for the situation of hard network connection, decided to store the information not only on the Bluemix but also on the FlashAir. 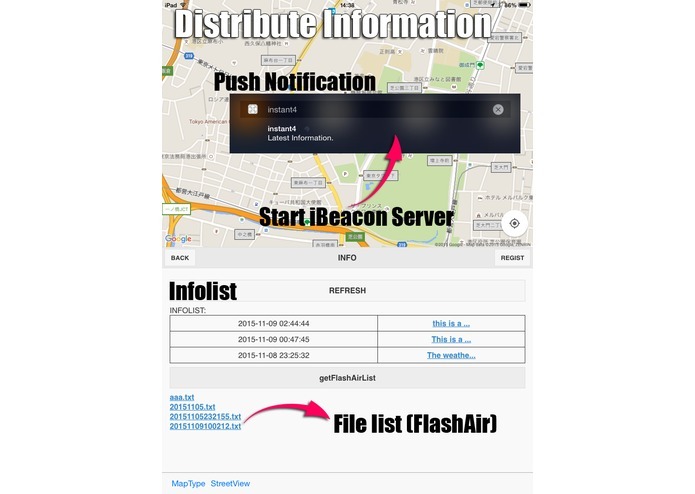 ・Notice from iBeacon server can be sent without starting the application. Though this system is focused on the shelter managers to use at this time, this application is also designed for easy and immediate use of everyone(ex. : volunteer team, back-end team) without make limitation for any scale of teams and groups.